BEVERLY HILLS, Calif. (February 27, 2019) – Stan Lee’s POW! Entertainment, the multimedia company founded in 2001 by the iconic comic book creator Stan Lee with his friend and business partner Gill Champion, is proud to celebrate the monumental events of this year’s Academy Awards, which not only honored the company’s beloved founder on screen, but also some of the biggest wins of the year went to movies based on Stan Lee’s original characters. On Sunday February 24th, Hollywood’s biggest stars and film elite came out to celebrate the 91st Academy Awards, known as the Oscars, and it was already a record-breaking moment for the comic book industry as it was the first year that a film based on comic book characters have been nominated for the “Best Picture” category. The night went on to mark the history books yet again when two films, “Black Panther” and “Spider-Man: Into the Spider-Verse,” based on characters Stan Lee co-created, went on to win multiple Oscars. “Spider-Man: Into the Spider-Verse” took home the Oscar for Best Animated Feature, while “Black Panther” won three awards for Best Original Score, Production Design, and Costume Design. Throughout the award season and multiple award shows both of the films have been praised universally by critics and audiences alike for their unique storytelling and their ability to push boundaries in society today. “Spider-Man: Into the Spider-Verse” dazzled audiences as an animated film while the critically acclaimed “Black Panther” broke box office records and was universally recognized for being a mostly-black ensemble cast. 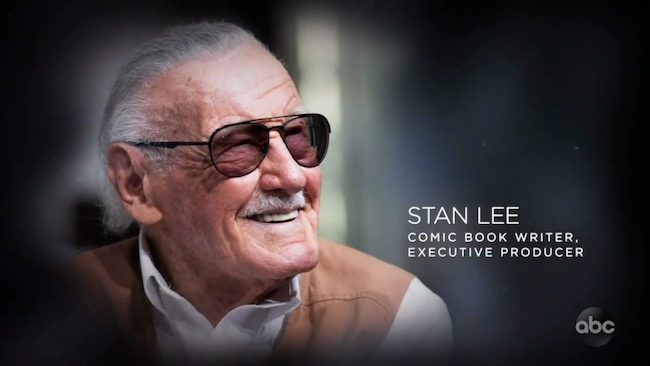 During this year’s ceremony, televised to 30 million people worldwide, Stan Lee was also remembered in the “In Memoriam” tribute recap to all the legends and icons the world has lost in the past year. Despite being told to hold their applause, Oscar attendees inside the Hollywood Dolby Theatre clapped upon seeing Stan’s instantly recognizable image appear on the big screen as a nod to his incredible legacy, a body of work quite unlike anything ever before it. Stan Lee’s POW! Entertainment continues to operate under the guardianship of his business partner Gill Champion, who serves as the President, alongside company CEO Scott D. Williams. The company has been and will continue to be the guardian of Stan Lee’s legacy and is excited to roll out new projects and adventures Stan had been working on. This month alone, Stan Lee’s POW! Entertainment announced two high profile partnerships with two large toy brands – Mego Corporation and Funko – to develop new toys based on Stan Lee intellectual property.